The recent archaeological excavations in Piazza della Signoria have furnished evidence that present day Florence was already occupied in prehistoric times. Other signs document the presence of a village in the early iron age and in Etruscan times. But the real foundation of the city dates to Roman times and the oldest part of the city with its network of streets in an orthogonal pattern bears the imprint of these Roman origins. What the earliest chronicles had to say about the origins of the city, albeit in fable form, seems therefore to be based on fact. When it originated as one of Caesar's colonies, the operations involved in founding the castrum and the division of the land into centuriae began in the spring of 59 B.C., at the time of the ludi florales (the probable source of the name Florentia). The colony was laid down following the axis of the consular Via Cassia, which ran along the northern edge of the Florentine basin. For the sake of defense, the city was set at the confluence of two streams (the Arno and the Mugnone) where the oldest populations had previously been located. Rectangular in plan, it was enclosed in a wall about 1800 meters long. The built-up area, like all the cities founded by the Romans, was characterized by straight roads which crossed at right angles. The two main roads led to four towered gates. The decumanus maximus (at present the streets of the Corso, Speziali and Strozzi) and the cardo maximus (Piazza San Giovanni, Via Roma and Via Calimala) converged on a central square, the forum urbis (now Piazza della Repubblica) where the Curia and the Temple dedicated to the Capitoline Triad (Jupiter, Juno, and Minerva) were later to rise. The topography of the city differed in its orientation from that established by the division of the surrounding land into centuriae, whose axis was, as mentioned, the Via Cassia. The castrum, on the other hand, adhered to the classical ritual of an orientation based on the cardinal points. 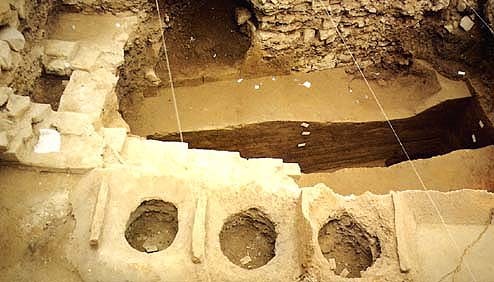 Archaeological finds, many of which came to light during the course of works which "gave new life", to the old city center, have made it possible to locate and identify the remains of various important public works: the Capitoline Baths, the Baths of Capaccio, so-called from the point of arrival of the aqueduct from Monte Morello: "Caput aquae" (head of the waters = Capaccio), the sewage system, the pavement of the streets, the Temple of Isis (in the Piazza San Firenze) and other lesser temples, the Theater (now the area is occupied by the back of the Palazzo Vecchio and by the Palazzo Gondo) and the Amphitheater, whose perimeter is still to be seen in the curve of various streets: Via Torta, Via Bentaccordi, Piazza Peruzzi. Some of these buildings were outside the walls (the Theater and the Amphitheater, for example) which testifies to the urban development of the original settlement, probably as early as the 1st century B.C. The Arno was also outside the walls (the city developed on the right banks), with a river port that constituted an important infrastructure for the city, for in Roman times the river was navigable from its mouth up to its confluence with the Affrico, upstream from Florence. The location of the city at a spot where it was relatively easy to cross the Arno had not been left to chance and was typical of the centers that originated as potential bridgeheads. In fact a bridge was built here probably around the 1st century B.C., the first bridge in Florentine history, in all likelihood somewhat upstream from today's Ponte Vecchio. In the overall picture of the Roman territorial organization Florentia was the focal point of a district in which its function as a city balanced its status of thoroughfare, with the bridge over the Arno keeping the communication routes in the hills to the south in touch with those of the Appenine crossings. The city developed rapidly thanks to its favorable position and the role it played in the ambit of the territorial organization in the region. It soon superceded Arezzo as the leading center in northern Etruria and was chosen as the seat of one of the correctores Italiae. Economic power was the driving force behind the urban growth of the young colony. Commercial activity and trade thrived thanks to the fact that important communications routes (land and water) intersected at Florentia and offer an explanation for the presence of those oriental merchants, probably on their way from Pisa, who first introduced the cult of Isis and then (2nd century) Christianity. The earliest indications of the Christian religion are bound to the cults of the deacon Lorenzo and the Palestinian saint, Felicita. Both first arose in the suburbs, the districts which had risen outside the walls along the consular roads which left the city. It was there that the oldest Florentine churches were built: San Lorenzo consecrated in 393, the first diocese, and Santa Felicita, whose origins go back to the 4th 5th centuries. According to legend, Saint Miniato one of the members of the first Christian community, also came from the east. Together with eight of his companions he was martyred in the year 250 during the persecutions ordered by Decius.A little church on a hill-top overlooking Florence was built for him. The Florentines do not however seem to have had a bishop prior to the late 3rd century. The first one recorded is San Felice who participated in a Roman synod in 313. It is interesting to note that contacts with the East continued. The most famous of the early Florentine bishops, San Zenobius, who lived in the early 5th century, also had an oriental name and, as early as the 7th century, Reparata, another Palestinian saint, was worshipped.